Another stencil bleaching project - I'm getting a bit into Steampunk, so I decided to make an airship themed jacket! It's black denim, 97% cotton, 3% elastane. I assumed it would bleach a yellowish color, but it has appeared to bleach a very pale melon color instead, a wonderful surprise! Some of it doesn't seem to have bleached bright enough, so I may be re-bleaching with identical stencils. I use spray adhesive on the backs of the newly-minted stencil, press onto the garment, mask fully, and spray bleach-water (Or straight bleach for denim, as in this case) with an airbrush. I love this process, it allows me so much creative flexibility! The gradient or 'fade' on the big gear was accomplished by holding a piece of cardstock with one hand, and airbrushing with the other, moving the paper around so as to avoid a hard line, and only allowing some of the bleach to reach the faded area. This is the first project I've tried that technique, wasn't sure what to expect, and I'm so happy with the way it turned out, it's just like on my computer screen! I think I may end up adding more embellishments to this jacket, as soon as I decide what they should be! =D But no more bleaching has yet been designed for this piece. Thanks for looking, just felt the need to share! The Jacket at the store! It fit me well, and made the cut! Then I pinned the jacket to an artboard that my hubby had laying around, didn't stretch the cloth in the work area, but forced it to lay nice and flat for me during the process, during which I had to pick up and move the artboard many times. Worked nice! Remembered to take pics of the final stencil process: The little gears. And viola! --This jacket bleaches bright watermelon at first, then the color fades. Great job! I have been wanting to try bleach stenciling for awhile now and this makes me want to try even more. Are you going to make an entire outfit to go with it? I mostly just hand draw designs onto things with bleach pens, but can second that you just never know what color you're going to bleach to underneath. I usually get a gold with darker fabrics. That pink must have been a nice surprise! I am looking to do a personal swap with (or will outright pay for) a knitter who could make an adult sized knitted t-rex sweater for Christmas. If anyone is interested, please let me know. I love this, especially the way you faded out the large gear. Gorgeous! I love your design. Your jacket looks amazing! You did a fabulous job (love anything Steampunk! ), and I particularly like the way the fading of the large gear makes it look like the airship is moving in front of the gear - it gives interesting depth to the image. The jacket also fits you perfectly - where did you get it? What an amazing project! I've got to agree with everyone else about the gradient on the large gear. Just breathtaking! 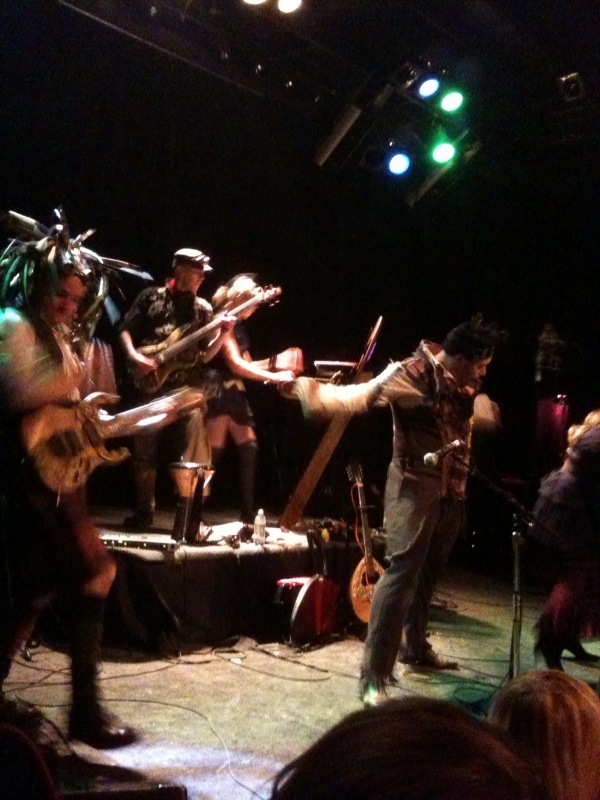 If you are into steampunk, but haven't heard of them, be sure to look them up, they go to steampunk shows nationally! Outfit plans: yes! Not quite sure what to do about it yet, but I did get a pin for it at the steampunk show I went to, they had steampunk vendors, it is a big brassy looking metal gear shape, and it says "Tesla Rangers" on it, hehe! makes me happy. ^_^ I definitely need a good skirt and some better goggles/aviator cap too! OOh!! Words can not describe how amazing I think this is!! Thanks for the bleach stencil tutorial I have been dying to do something with bleach stenciling and just didn't know where to start!